82: The Days & The Laughter Of The Past. I believe that I have some understanding of what the death of Phil has meant to you and his sister. For I have known Phil almost since the day we entered the Marine Corps in July, 1942, and this loss I feel more than any other of the War. Living with Phil was a pleasure, for he wore better and better the longer you knew him. And there’s no one I know who achieved more enjoyment from life or who made such and art of living. He always found enjoyment in what he was doing, and also in the people with whom he was, and similarly we found the same pleasure in being with him. Naturally, during these days where there are so comparatively few of us left in the officers’ area, our hearts yearn most strongly for the days and the laughter of the past. And I visualize Phil in so many different instances–after we returned from the Marshalls, Phil, Joe Swoyer, Chuck Bechtol and others used to be constant sitters at a nightly poker game which always lasted until the master switch was pulled at 11:30. And Phil always sat in his easy chair, which he had surreptitiously acquired, clad in his blue and white Jap kimono brought back from Namur, and which he considered his dressing gown. Or back at New River, when we all lived in huts with composition walls. And Phil living with Ed Keyes and Ted Johnson would vie with Joe Swoyer and myself to see who could maintain the most unkempt hut. It normally was a toss-up, especially on the day we all departed for the west coast. I hope you have the picture taken of Phil, Ted Johnson, Harry Reynolds, and myself aboard ship en route to Namur. That period of singing, and sleeping on deck under the stars was exhilarating and lasting. And one liberty that Phil and Joe and I had together in Honolulu. We spent the day pleasantly wandering about, betting vociferously on a baseball game we chanced upon between two youthful girl’s teams, and eventually getting back to the dock after hours and too late to get a boat back to our ship. Not at all nonplussed, we eventually attracted attention by lighting numerous matches, and boarded a harbor patrol craft. The operators enjoyed the occasion, and so for an hour and a half the three of us, and the two operators, took an extensive tour of the harbor amidst much laughter. These are just a very few of the many mental pictures that come back often and vividly. For Phil was such a loveable person. We always called him “Eagle,” shortened from “Legal Eagle,” which title he gained after his successful defense of a sergeant against the unjust attacks of a bigoted Colonel back at Camp Pendleton. Harry Reynolds always used to say – “Isn’t the Eagle marvelous in the role he portrays?” Which is perhaps not easy to explain. But by the “role” we always meant his lovability, his air of British aristocracy, his lack of physical coordination, and his inherent good nature, all wrapped up together. 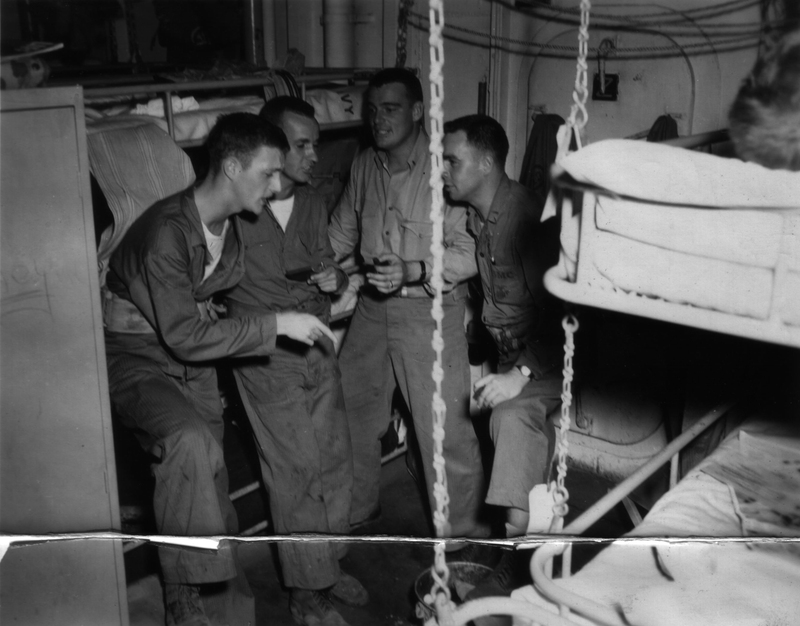 On board ship, most of us slept on deck where it was cooler, and Harry Reynolds, Capt. Schechter, Gene Mundy and I had a landing craft directly above the one the Eagle slept in with Joe Swoyer and Frank Shattuck. As we descended each morning, we would see the late-sleeping Eagle all curled up and sound asleep. And Harry inevitably said, “Isn’t the Eagle marvelous in the role he portrays?” –which he certainly was! Just as we who lived with him as officers loved him, so also were his men devoted to him. It was no hero-worship due to athletic prowess, etc. such as sometimes occurs in the men-officer relationship. Rather it was a much deeper and the natural response of a group of intelligent men to a leader in whom they believed and to whom they were devoted as much as he was to them. And it was the same way with his Sgt. Ervin, about whom Phil doubtless wrote. Ervin was pretty much an individualist, not given to affection, and on first impression, not a top notch NCO. But the mutual admiration and respect which grew between the two was obvious, and they were a strongly attached pair who worked together as well as any and better than most. It was Sgt. Ervin who, when Phil lay fatally wounded in an exposed position, called out “Don’t worry, Phil, I’m coming for you!” And Ervin went down to be killed at Phil’s side by the same Jap gun. There is so much more I should like to tell you both when I ever get to see you once we return. But I want you to know that no finer or truer gentleman have I ever known than Phil. He had our admiration and respect, and I had a feeling of kinship and attachment for him that goes far deeper than words. These personality traits were prized in the Raider unit that Ervin served with before joining Company A.
 Stott was not present at the time, being posted to Company C, so Ervin’s last words might be hearsay.